2.Table type and combinatorial design saves place and convenient for transportation. 3. Screen printing platen layer can rotate independently which is easy operated with higher efficiency. 4. Adjustable double-spring devices are available for screen frames of different weight. 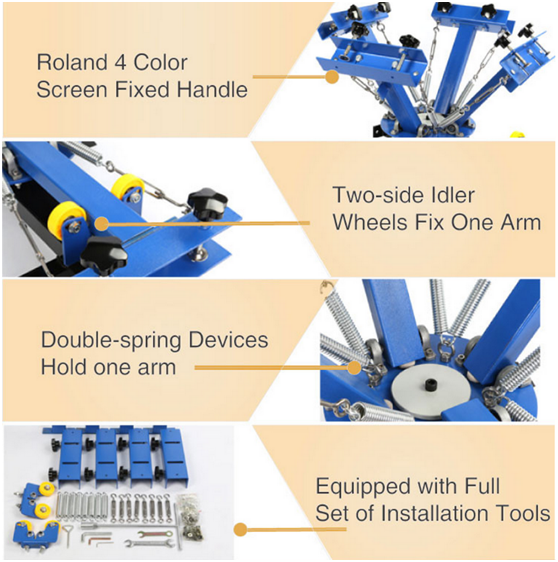 T4 Color 2 Station Single- Rotary Screen Press can simultaneously install four screen plates and the screen layer can rotate independently after installation, which is available for four colors’ overprinting and making progressive proofs of screen printing business. 5. Screen clamp can be moved up and down, which is suitable for screen frame within 1.8" (4.5cm) thickness. 6. Big supporting device keeps the machine stable and in balance. 7. All-metal construction, advanced electrostatic spraying and electroplating, durable, easy to clear and no rust. 8. Equipped with full set of installing tools, manual instructions, installation and operation videos. 9.Excellent packaging: All our equipments are perfectly packaged by high-strength five-layer corrugated carton, inside with standard soft and hard foam and three-ply board, all metal parts are separately packaged, which guarantees product safety during transportation. which is available for four colors’ overprinting and making progressive proofs of screen printing business. 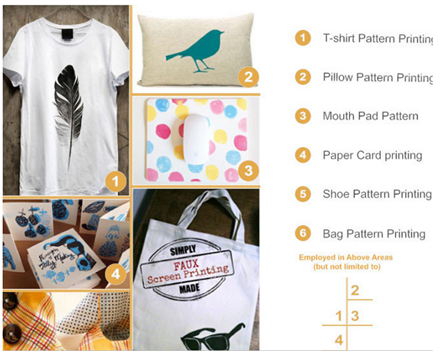 which is especially suitable for small businesses and individual printing shop.